ST. LOUIS — David Perron likes his new line. 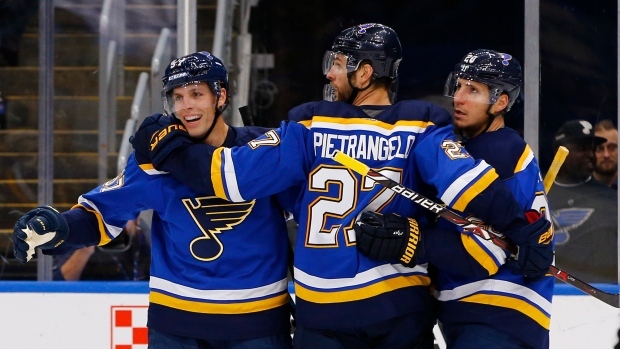 Perron scored his fourth career hat trick, Alexander Steen had a goal and an assist, and the St. Louis Blues beat the Calgary Flames 5-3 on Thursday night. Joel Edmundson also scored and Brayden Schenn had three assists as the Blues won for the first time this season. Jake Allen made 31 saves. Before the game, Blues coach Mike Yeo moved Perron up to the second line with Schenn and Jaden Schwartz. "It's quite different for sure," Perron said. "Kind of what I was used from last year. It's great. I thought (Steen's) goal really gave us some energy, too. It was good." James Neal, Derek Ryan and Mikael Backlund scored for the Flames. Mike Smith was pulled following the second period after allowing five goals on 24 shots. Perron gave the Blues a 2-1 lead midway through the first period. Edmundson, making his season debut after missing the first two games with a sore groin, made it 3-1 Blues with 2:38 left in the first, beating Smith high glove side. Perron's second goal early in the second made it 4-1. Smith misplayed the puck behind the net, allowing Schenn to steal it and find Perron alone in front with an empty net. "He's known to go play the puck and it just bounced on him," Schenn said. "I saw the D-man over my right shoulder and I knew I couldn't take it to the net and I saw Perron at full speed and I was just able to get it to him." Perron, playing in his third stint with the Blues, completed the hat trick with 35 seconds left in the second. His last hat trick also came at Calgary's expense on Oct. 22, 2016. "It feels great for sure," Perron said. "We had a good practice week and I think that a lot of people were starting to panic (with the slow start) but I don't think the players were." Neal gave the Flames a 1-0 lead at 7:32 of the first. Sam Bennett set it up with a nice move in front, causing Allen to commit and leaving an opening for Neal. "I put pressure on myself to score every night and it's nice to get my first one in a Flames jersey," Neal said. Steen answered for the Blues just 16 seconds later. The goal gave Steen 453 career points, surpassing Al MacInnis for seventh in Blues history. Allen got help from his post on Sean Monahan's penalty shot late in the first period. He also made several tough saves as the Blues killed off a 5-on-3 for 1:35 late in the second period. "It was big, didn't give them any momentum, which was huge," Allen said. "So I think that was the biggest thing at the end of the day what came out of it. If they got a goal out of it that may have generated a little more positivity on their side so it was nice to shut that down." Ryan and Backlund scored in the third for Calgary to cut the deficit to two. NOTES: David Rittich stopped eight shots in relief of Smith. ... Blues rookie centres Jordan Kyrou and Robert Thomas each earned their first career points with assists. ... Flames C Dillon Dube (lower body) had an assist, despite missing practice on Wednesday. ... The Blues scratched RW Chris Thorburn, D Vince Dunn and D Jordan Schmaltz. ... The Flames scratched D Dalton Prout, RW Garnet Hathaway and C Mark Jankowski. Calgary: Visits Colorado on Saturday night. St. Louis: Visits Chicago on Saturday night.